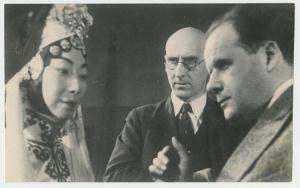 Looking for a nice little piece on Mei Lanfang’s 1935 Moscow performances witnessed by (among others) Bertold Brecht? Here you go. There is a nice description of his earlier American tour in Catherine Yeh “China, a Man in the Guise of an Upright Female: Photography, the Art of the Hands, and Mei Lanfang’s 1930 visit to the United States” in Henriot, Christian, and Wen Hsin-yeh, History in Images: Pictures and Public Space in Modern China. Berkeley: Institute of East Asian Studies, 2013.